For other uses, see Holy family (disambiguation). 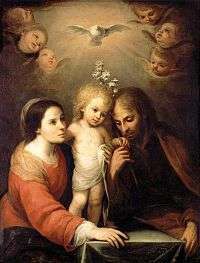 The Holy Family consists of the Child Jesus, the Virgin Mary, and Saint Joseph. Veneration of the Holy Family was formally begun in the 17th century by Saint François de Laval, the first bishop of New France, who founded a Confraternity. Holy Family holy card. University of Dayton Libraries. The Gospels speak little of the life of the Holy Family in the years before Jesus’ public ministry. All that is known are the Circumcision of Jesus, the sojourn in Egypt, the return to Nazareth, and the Finding in the Temple. The parents were apparently observant Jews, making the pilgrimage to Jerusalem every year with other Jewish families (Luke. 2:41). The Feast of the Holy Family is a liturgical celebration in the Catholic Church in honor of Jesus of Nazareth, his mother, the Blessed Virgin Mary, and his foster father, Saint Joseph, as a family. The primary purpose of this feast is to present the Holy Family as a model for Christian families. Since the 1969 revision of the General Roman Calendar, the feast is celebrated on the Sunday within the Octave of Christmas, the Sunday between Christmas Day and New Year's Day (both exclusive), or when there is no Sunday within the Octave (if both Christmas Day and the Solemnity of Mary, Mother of God are Sundays), it is held on 30 December, a Friday in such years. It is a holy day of obligation only if it falls on a Sunday. The feast was instituted by Pope Leo XIII in 1893 and set on the Sunday within the Octave of the Epiphany; that is to say, on the Sunday between January 7 through January 13, all inclusive (see General Roman Calendar of 1960). The 1962 Roman Missal, whose use is still authorized, follows the General Roman Calendar of 1960, which has the celebration on that date. 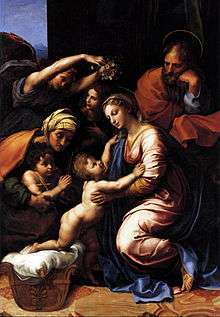 The Holy Family was a popular theme in Christian art. An oil painting by the Dutch Joos van Cleve, dated to about 1512, is on display at the New York Metropolitan Museum of Art. Michelangelo's tempera rendition (c. 1506) hangs in the Uffizi in Florence, Italy. A Holy Family by Giulio Romano is on view at the Getty Center in Los Angeles, California. 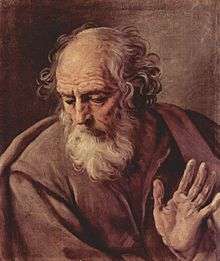 Saint Joseph (c. 1640) by Guido Reni. The members of the Holy Family are the patrons of the Congregation of Holy Cross. The Holy Cross Sisters are dedicated to the Immaculate Heart of Mary, the Holy Cross Brothers to St. Joseph, and the Priests of Holy Cross to the Sacred Heart. 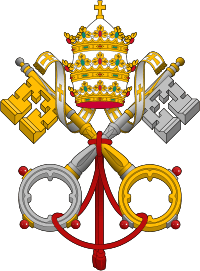 The Sons of the Holy Family is also a religious congregation devoted to the Holy Family. The Cathedral of the Holy Family of Nazareth is in the cathedral parish of the Diocese of Tulsa in Oklahoma. A pious practice among Catholics is to write "J.M.J." at the top of letters and personal notes as a reference to Jesus, Mary, and Joseph as the Holy Family. ↑ It is not among the ten feasts listed in canon 1247 of the 1917 Code of Canon Law and canon 1246 of the 1983 Code as holy days of obligation. ↑ Perrotta, Louise Bourassa (March 2000). Saint Joseph. Our Sunday Visitor Publishing. p. 149. ISBN 978-0-87973-573-9. Wikimedia Commons has media related to Holy Family.